Oh my goodness, how lucky were we. The most picture perfect postcard Byron day. A beautiful property perched up on the Coolamon ridge, a stunning studio… something we’d be happy to live in… and a gorgeous creative woman to chat with over a cup of tea whilst we drank in the view. Ros Swadling is an emerging artist who gains an overwhelming source of inspiration from the surrounding nature and environment of her property. 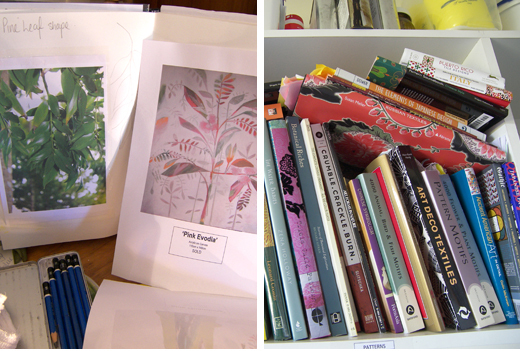 We visited her this week for a peek at her studio and her current works. We were amazed at what we found. This woman is prolific! Can you just give us some background on how you came to Byron Bay? About 20 yrs ago we use to come here from the Gold Coast with the kids, my sons Jason and Nathan, for surfing holidays. We loved the green of the place, the beach, and surfing. So it started there. I had lived on the Gold Coast for over 30 years and had businesses there. I had separated from my husband for 5 years when I met my partner, Ian, in 2000. We were both semi-retired and started working on some projects together to keep us busy. We also started coming to Byron for holidays and decided we wanted a holiday home here to get away from the traffic of the Gold Coast. Initially we looked at Belongil Beach but felt the warnings of the climate change and rising sea levels could not be ignored. 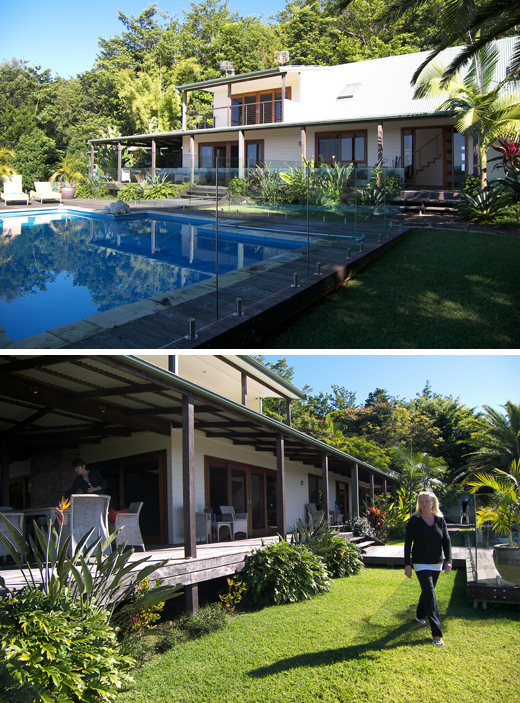 So we started looking at the Hinterland – Coorabell, St Helena, Bangalow. We came back to this property at Coorabell 4 or 5 times. One day we heard that this location had been an ancient rainforest where Aboriginal women would come for healing. We felt there was something special in that alone so we bought it. At first we rented out the cottage and then finally decided to renovate and move here in 2003. 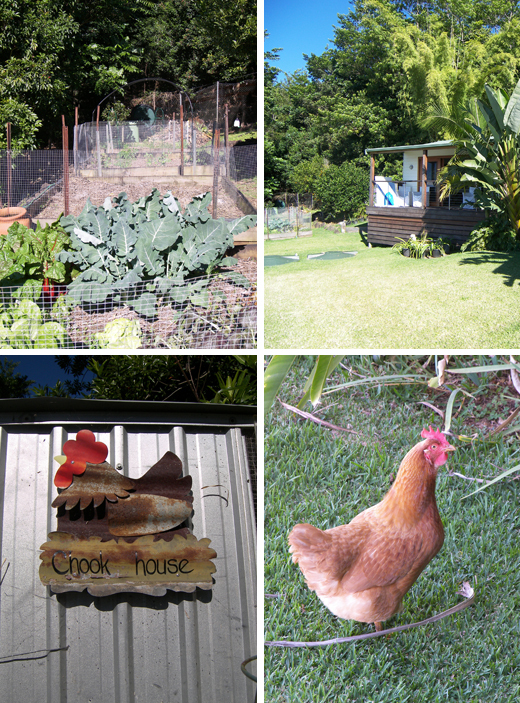 Life on the farm – the obligatory veggie patch and chook… Cinnamon. You said earlier you wanted a holiday house but its obvious it’s become more than that? Knowing this land use to be an ancient rainforest we felt we wanted to help regenerate it. We want to reforest this valley. When we bought it, it had a ‘forest harvesting guarantee’ which means we are allowed to take out trees. However this is not what we are going to do. We’ve taken out camphor laurels but we won’t be harvesting. We have now planted 1000 trees a year for the last three years. When we came here the former owner had already planted 8,000 trees and we have added another 3,000. Now we have about 12,000 trees planted on this land. We plant red cedar, silky oak and other natives. Planting this many trees by hand has been a lot of hard work but really helped me connect to the land and the environment. I just love it here. Yet after three years of planting trees and losing some due to bad weather I felt I needed to pursue my creativity. I started looking at going to Uni and TAFE in Lismore and settled on the Diploma in Fine Arts at TAFE. So how did you find studying art? Challenging, but really pleased I did it now, and am considering going to Uni next year for a degree. I gained a lot of knowledge in processes and techniques and it has given me direction in my painting and printmaking. What do you feel is your direction is now? Painting is my love. It’s truly deeply inside me. I’m not sure about the printmaking yet, I’m still developing that. I live in this most amazing area and pristine environment and as I mentioned, I’m really inspired by that. I am currently seeing lots of small birds when I am out in my veggie patch. The Yellow Breasted Robin and Blue Fairy Wren are my favourites at the moment, and I’m also working on a series of rainforest trees such as the Kauri Pine. Talk us through your creative process, is it intuitive? It’s half half actually. I do a lot of planning and preliminary drawings. Maybe 10-12 drawings before starting a painting, but once I get going something else kicks in and it never ends up how I planned. I am an intuitive colourist and a slow painter because don’t forget I’ve got the farm. It takes up a lot of my time, but it does give me more inspiration being out amongst it…even the patterns on the trees, the moss, and the detail in the lichen. I was out there the other day and just had to take some photos of this tree and it’s amazing trunk. 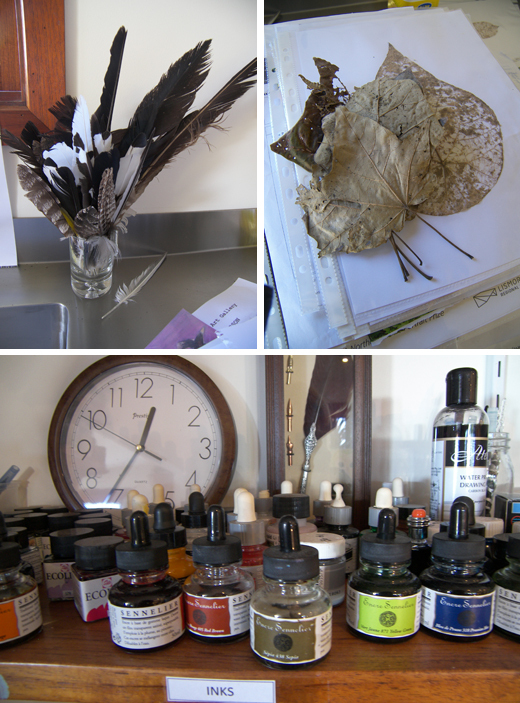 Ros’s studio is a haven of nature’s collectables and art supplies. Every artist’s dream. When my son, Jason, was ill with leukemia I couldn’t work…so I started painting to fill in my time whilst he was sleeping. We lived near an art supply shop that held classes out the back. I would sometimes take Jason and my Mum there and we would just hang out and paint together. Jason was a very good artist and after he died his school acquired one of his paintings for The Southport Boys School gallery. This was in 1996 and he was 12. I never picked up a brush until he got sick. I was caring for him and he couldn’t go to school and I couldn’t go to work, so it was a kind of therapy. 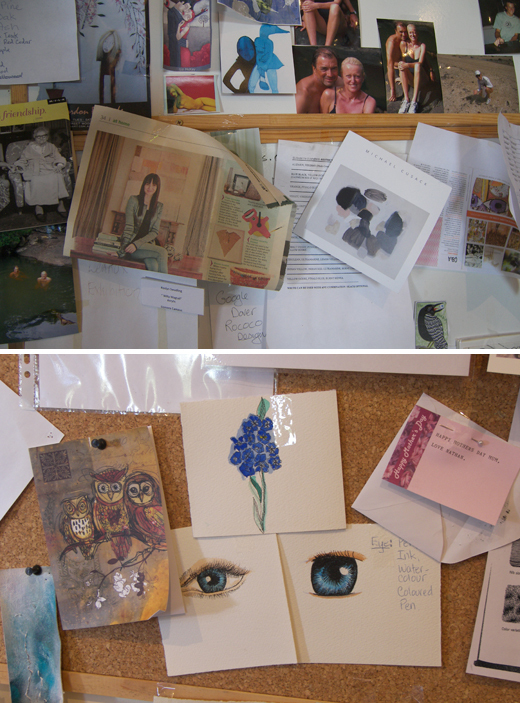 Postcards, photos, notes of love and memory keep the eyes interested. Who has inspired or influenced you with your art? My close friend and art teacher on the Gold Coast, the late Peter Abraham together with my Mum, Aileen, who was a graphic artist in the 1960’s have both been an amazing influence on me and my work. Of course more recently were the wonderful teachers at TAFE – Steve Giese, Michael Cusack, Robyn Sweeney and Christine Willcocks who have all helped shape the direction my artwork is now taking. I’m a semi-abstract naturalist painter…well that’s what they told me at TAFE… so the works of Lee Krasner (who was married to Jackson Pollack) and Picasso I just love. Australian contemporary artists include Karlee Rawkins, Kirra Jamison and Del Kathryn Barton. I am also drawn to the Superflat movement and Pop Surrealism, especially the work of Yoshitomo Nara. Travel has also been a huge influence. In 2008 Ian and I went to Europe for 10 weeks and I got to visit every gallery and art monument I could get to including the Louvre (Paris), Ufissi (Florence), Peggy Guggenheim’s Gallery (Venice)…Ian and I got engaged in Venice, he asked me on a Gondala! St Peter Cathedral in Rome and of course the Sistine Chapel to see Michael Angelo’s amazing work. As an emerging artist what are you aiming for in the near future? I’ve been lucky enough to sell some of my work through local exhibitions and art prizes such as The Caldera and The Border last year. Every painting I sell I give 10% to the Oncology Children’s Foundation for research into a cure for leukaemia. I aim to keep entering art prizes and try to get into some local galleries. 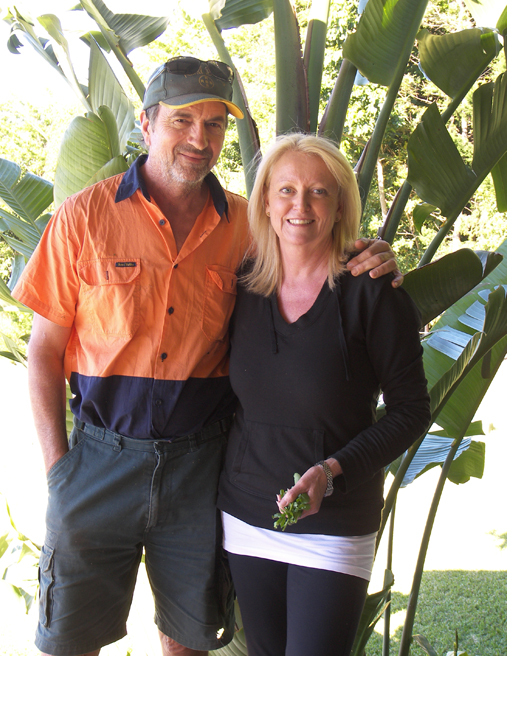 Ros and Ian – giving back to the land with reforesting their property. 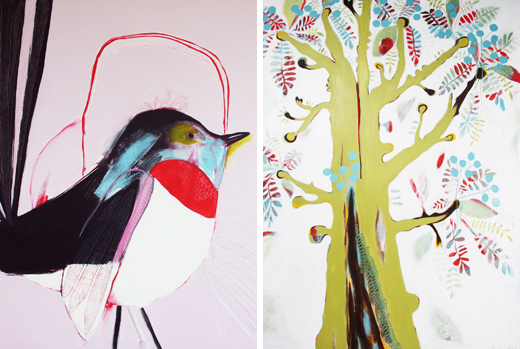 Ros’s art is bold, deliciously colourful, with a graphic element of repeated pattern and very desirous to own. Her current subject matter of indigenous birds and trees reflects the pristine quality this part of the world offers and her connection with it. Ros may be an emerging artist but let us be one of the first to predict …not for long! What’s your favourite Byron café and restaurant? Café – Twisted Sista – they have the greatest muffins in the world! They should be on your bucket list. Restaurant – Bangalow Pub – we always go there. What were your first impressions of Byron? Green, casual, grounded. Don’t have to get dressed up and can just be yourself. Walking up to the Lighthouse with my partner, Ian, followed by breakfast at Twisted Sista Café, picking up the Sydney Morning Herald and reading art critic, John McDonald’s column. I look at heaps of Australian gallery websites for research – Tim Olsen, Flinders Lane, Anthea Polson, Roslyn Oxley 9, King Street Sydney and also overseas – MOMA New York. What’s your favourite shop in Byron? 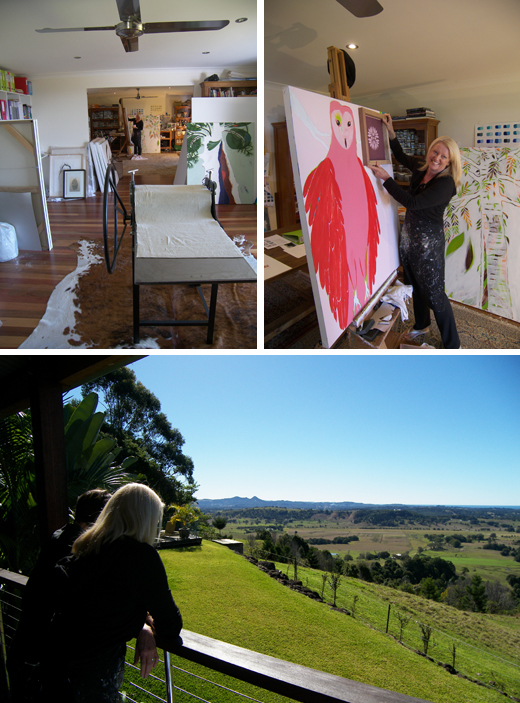 Restrospect Gallery in Byron Bay and Barebones Gallery in Bangalow. My most favourite thing to do in Byron would to be walk each morning up to the lighthouse and back along the beach with Ian. It just makes me feel so alive sometimes we swim after only in summer though. What’s your local tip to a visitor to Byron? You must have a picnic at Rocky Creek Dam and walk to Minyon Falls. This entry was posted in Lifestyle, People and tagged Artist, Byron Bay, Lifestyle, Rainforest, Travel by Very Byron. Bookmark the permalink. Hi Helen, I forwarded your comments onto Ros. Cheers.